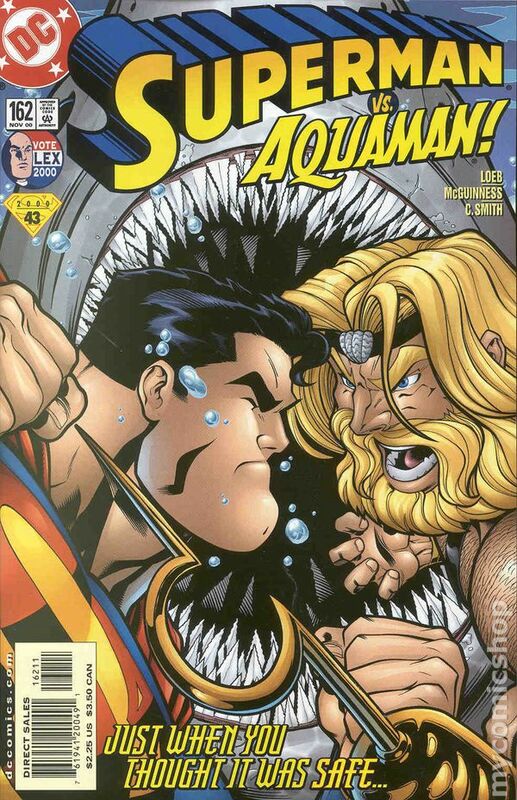 Published Jan 2000 by DC. WRITTEN BY JEPH LOEB; ART BY MIKE MCKONE AND MARLO ALQUIZA; COVER BY DWAYNE TURNER AND DANNY MIKI In stores November 3. Aquaman makes a cameo in an exciting issue, featuring a striking cover by Dwayne Turner (Curse of the Spawn) and Danny Miki, who provide all of this month's Superman-ongoing titles' covers! All his life Superman has kept himself in check, never unleashing his full power for fear of killing someone. Now the son of Mongul is asking him to unleash his full potential in order to save Earth, but in doing so will the Man of Steel lose himself? Plus, Jimmy shoots the scoop of the century, which has everyone asking, "Who is Mrs. Superman?" FC, 32 PG." Cover price $1.99. 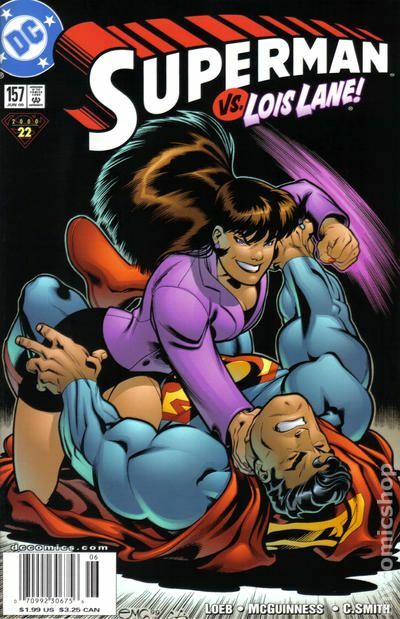 WRITTEN BY STUART IMMONEN AND MARK MILLAR; ART BY JOE PHILLIPS AND JOSÉ MARZAN JR.; COVER BY DWAYNE TURNER AND DANNY MIKI Obsession returns and she believes only she can make the claim of being Mrs. Superman. Anybody that gets in the way will have hell to pay, which may have something to do with why some kids are turning into demons. To stop the crisis, Superman may have to team up with his number-one fan. FC, 32 PG." Cover price $1.99. WRITTEN BY MARK SCHULTZ. ART BY DOUG MAHNKE AND TOM NGUYEN. COVER BY DWAYNE TURNER AND DANNY MIKI. In stores November 17. 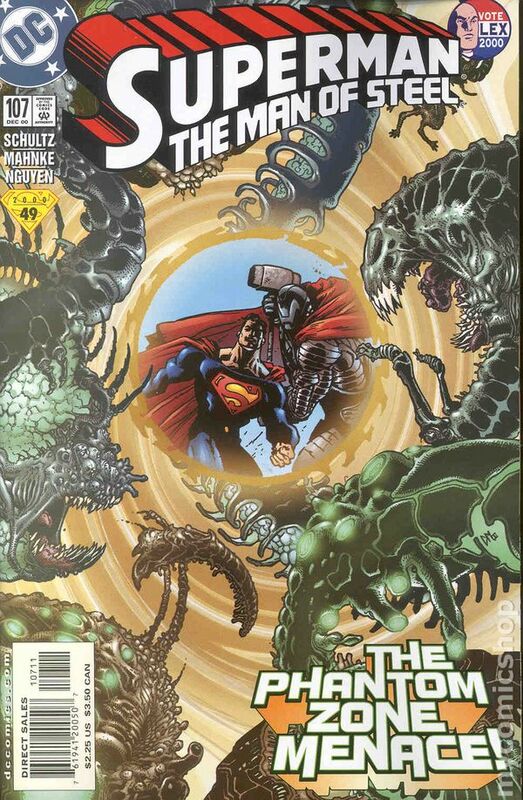 The JLA makes a cameo appearance as Superman battles one of his Kryptonian ancestors! You can take the man from Krypton, but you can't take Krypton from the man...nor should the man's wife bring any souvenirs from his Fortress of Solitude, unless they don't mind having their apartment redesigned in the latest Kryptonian decor. Clark must prove his humanity against an ancestor who wants to remake his world. 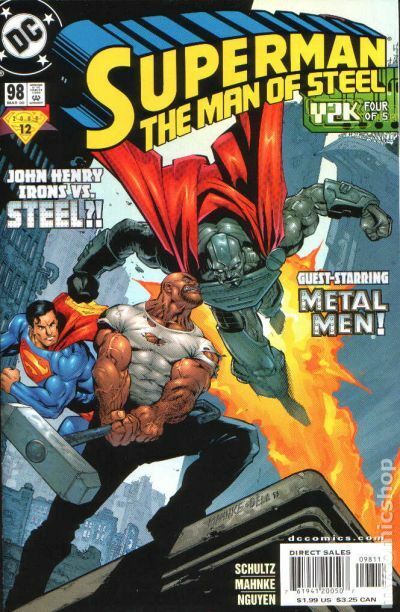 Plus: The JLA helps explain the "Mrs. Superman" fiasco and Steel provides the S.C.U. with new weaponry. FC, 32 PG." Cover price $1.99. WRITTEN BY JOE KELLY; ART BY GERMAN GARCIA AND JOE RUBINSTEIN; COVER BY DWAYNE TURNER AND DANNY MIKI. Wonder Woman guest-stars in a thrilling issue! Although the truth about the so-called "Mrs. Superman" has been revealed, the public still wonders about the Man of Steel's relationship with Wonder Woman. So what happens when both heroes find themselves exiled in the land of Valhalla for a thousand years? Will they give into romantic temptation? Or will a multitude of demons kill them first? Full Color, 32 pages. Cover price $1.99. First appearance of Imperex. 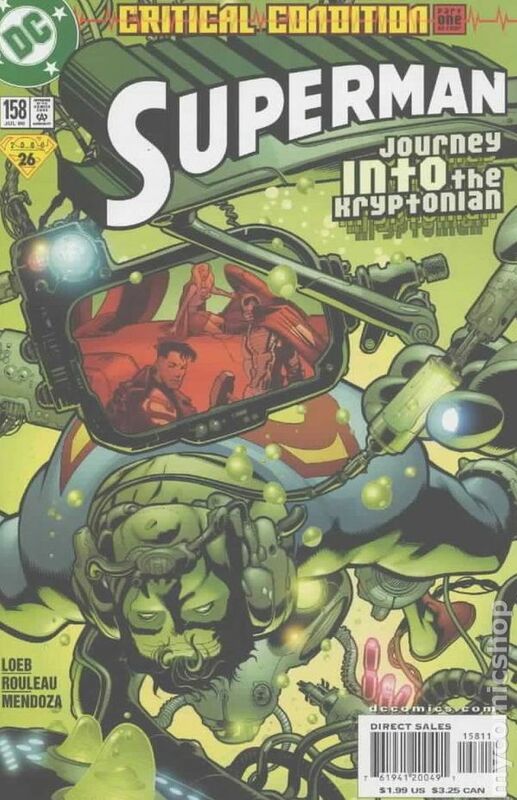 WRITTEN BY JEPH LOEB; ART BY MIKE MCKONE AND MARLO ALQUIZA; COVER BY IAN CHURCHILL AND NORM RAPMUND Done with his lethal training at the side of young Mongul, Superman and the junior villain head into the depths of space to confront Imperiex. This enigmatic being is powerful enough to live in a black hole and all too ready to turn the Earth into one! Will Superman's new battle skills be enough to stop Imperiex? And can the Man of Steel trust his new ally? FC, 32 PG." Cover price $1.99. WRITTEN BY STUART IMMONEN AND MARK MILLAR; ART BY YANICK PAQUETTE; COVER BY LEE BERMEJO AND JIM ROYAL. 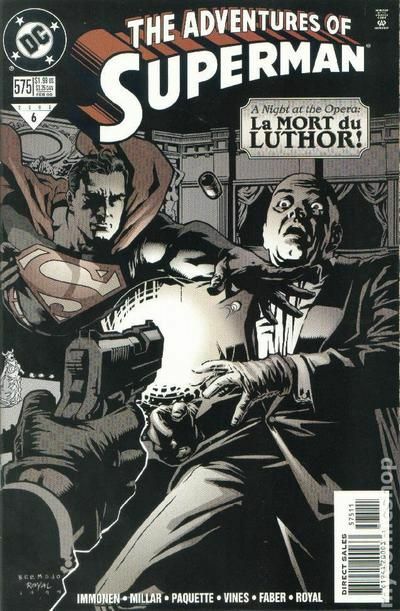 Will Luthor die before the fat lady sings? It's a night at the opera for Mr. and Mrs. Clark Kent, but our hero's superheroic duties may ruin the evening for the couple. That is if an assasination attempt on Lex Luthor's life doesn't first! FC, 32 PG." Cover price $1.99. WRITTEN BY JOE KELLY; ART BY BUTCH GUICE AND KEVIN CONRAD In stores December 29. 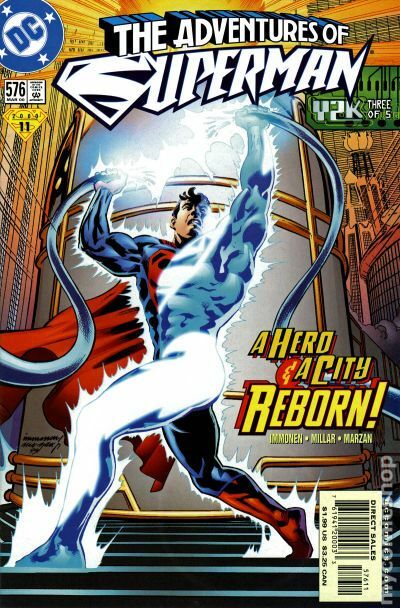 While a new Gotham City rises from the ashes of "No Man's Land," the city Superman calls home also is reinvented just in time for the year 2000 in SUPERMAN Y2K, an 80-page one- shot that changes the look and feel of Metropolis with dramatic repercussions for the future of all the Superman monthly titles. Written by Joe Kelly (ACTION COMICS, Deadpool) with pencils by Butch Guice (RESURRECTION MAN, LEGENDS OF THE DC UNIVERSE) and inks by Guice on present-day scenes and Kevin Conrad (Kiss: Psycho Circus) on flashback sequences, SUPERMAN Y2K begins simply enough with Ma and Pa Kent wanting to spend New Year's Eve with Clark and Lois. By the end, the Earth goes black at the stroke of midnight, and it's up to Superman, Green Lantern, the Martian Manhunter, and other members of the JLA racing to save the world from destruction. And when the lights come up, Metropolis is not the same city it was just minutes earlier. At the heart of it is Lex Luthor ? whose role throughout Metropolis's history is revealed in shocking detail ? 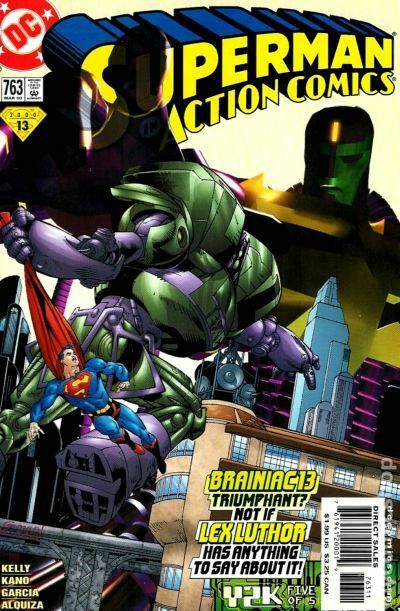 and Brainiac 2.5, who have ushered a futuristic evil into the modern world, an evil neither villain can control. Now the mechanized lifeforms of the DCU are also under this strange menace's control, and to re-enter Metropolis, Superman will have to go through THE TITANS' Cyborg, YOUNG JUSTICE's Red Tornado, the JSA's Hourman, the Metal Men, and more! WRITTEN BY MARK SCHULTZ. ART BY DOUG MAHNKE AND TOM NGUYEN. COVER BY BRYAN HITCH AND PAUL NEARY. Leading into the New Year's Eve countdown to midnight, the JLA's Steel recalls an attack on Stryker's Island by the Eradicator. 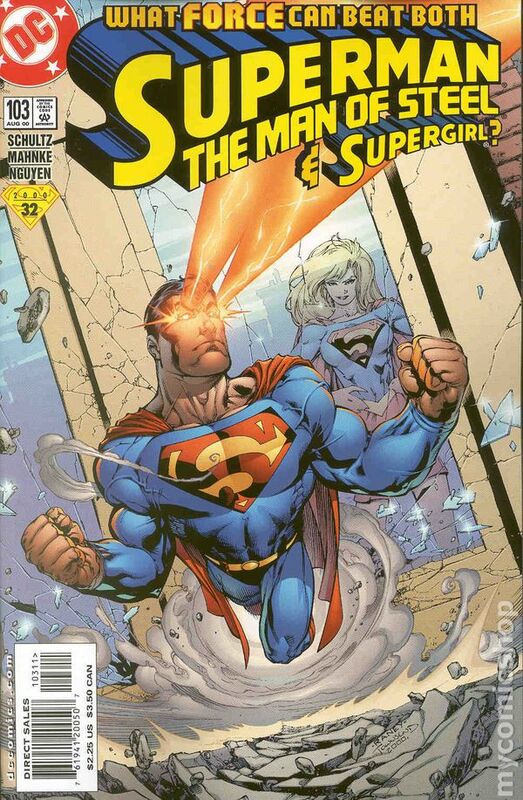 With inmates running for their lives can even Steel and Superman hope to stop them all, and can anything bring Eradicator to his senses before next month's crucial Y2K/transformed Metropolis storyline? Cover price $1.99. 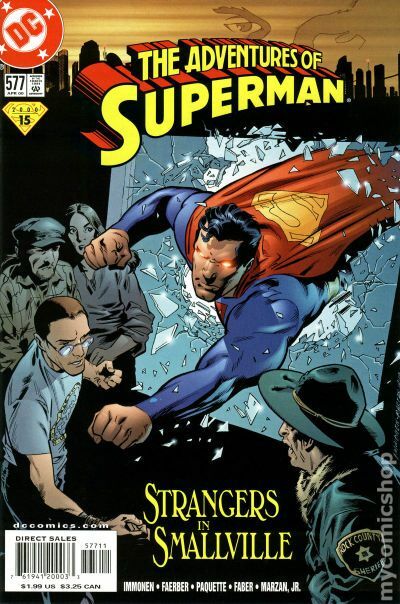 WRITTEN BY JOE KELLY; ART BY GERMAN GARCIA AND JOE RUBINSTEIN; COVER BY HUMBERTO RAMOS AND WAYNE FAUCHER Superman has survived many threats, but will last-minute holiday shopping be his undoing? When the Demon Etrigan (last seen in DAY OF JUDGMENT) poses as Santa Claus, he unleashes everyone's true Christmas spirit, including Lois Lane's, which includes a surprising secret that gains form as a mini-Lex! Full Color, 32 pages. Cover price $1.99. WRITTEN BY JEPH LOEB; ART BY ED MCGUINNESS AND CAM SMITH; COVER BY MCGUINNESS AND JOHN DELL Ed McGuinness comes onboard as new penciler as the Brainiac 13 saga (which began in SUPERMAN Y2K) continues! As Metropolis morphs into a futuristic city capable of containing the new Brainiac (represented in an extraordinary CGI creation), Superman must cope with all the threats that come with his revamped stomping grounds, including a brand-new Metallo that towers over the city. Even with the help of the Metal Men, the Last Son of Krypton is outgunned. Meanwhile, Luthor finds salvation in the form of his daughter. Plus, the most unexpected return of all! FC, 32 PG." Cover price $1.99. WRITTEN BY STUART IMMONEN AND MARK MILLAR; ART AND COVER BY IMMONEN AND JOSÉ MARZAN, JR. Continuing the Brainiac 13 storyline. New Metropolis has risen, but has a new Superman as well? Or is it one we've seen before? The battle heats up as Luthor, Mercy and Hope fight alongside the old Brainiac in hopes of finding Brainiac 13's weakness while the world teeters on the brink of doom! FC, 32 PG." Cover price $1.99. WRITTEN BY MARK SCHULTZ. ART AND COVER BY DOUG MAHNKE AND TOM NGUYEN. The Brainiac 13 contamination is spreading throughout the world, but meets with resistance from what's left of Superman's Fortress of Solitude in the Arctic. The surviving Kryptonian technology wants to take control of the Brainiac 13 virus in its own bid to conquer the Earth, and Superman and the human Eradicator are caught in the middle of the apocalyptic showdown. It will take the ultimate sacrifice to stop the war of the machines! FC, 32 PG." Cover price $1.99. 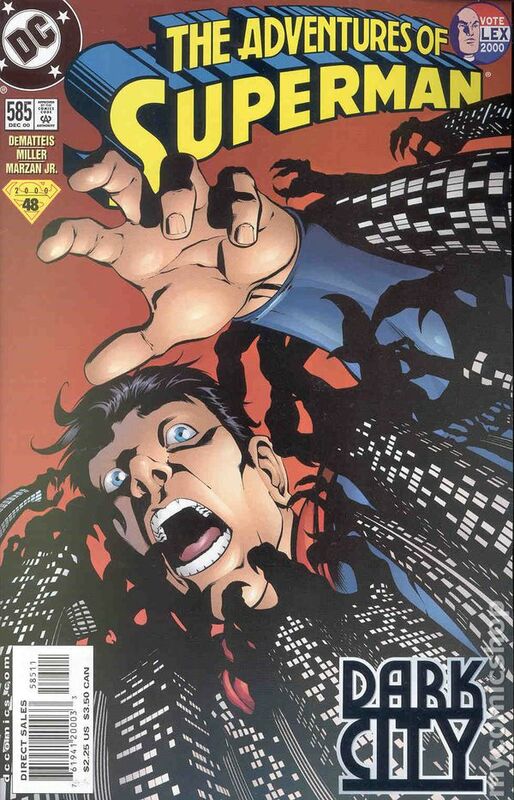 WRITTEN BY JOE KELLY; ART BY GERMAN GARCIA AND JOE RUBINSTEIN; COVER BY GARCIA AND JAIME MENDOZA. The grande finale to the Brainiac 13 storyline! There is no way that Superman can stop Brainiac 13 on his own. The only one with a weapon capable of stopping the cyber villain is...Lex Luthor! Can the Man of Steel trust his greatest enemy? And what shocking personal price must Luthor pay to win the battle? Full Color, 32 pages. Cover price $1.99. Published Apr 2000 by DC. 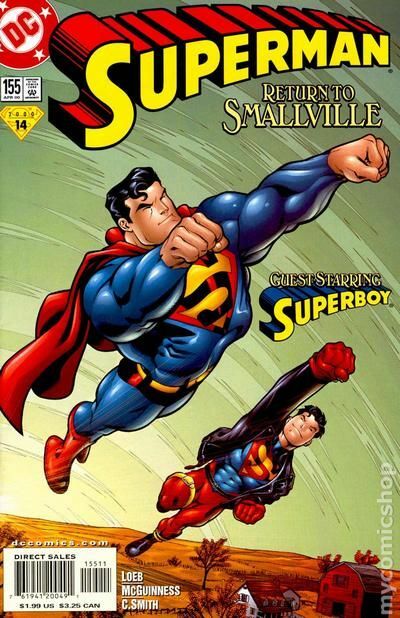 WRITTEN BY JEPH LOEB; ART AND COVER BY ED MCGUINNESS AND CAM SMITH Superboy guest stars in a tale of two cities, contrasting the new mega-city of Metropolis and the prototypically rural Smallville. After making sure that the transformed Metropolis is safe, Superman decides to head back to the homestead for a little R & R, and is surprised to find the Teen of Steel hanging around the family farm. Can Clark keep his secret identity hidden with the Kid around? FC, 32 PG." Cover price $1.99. 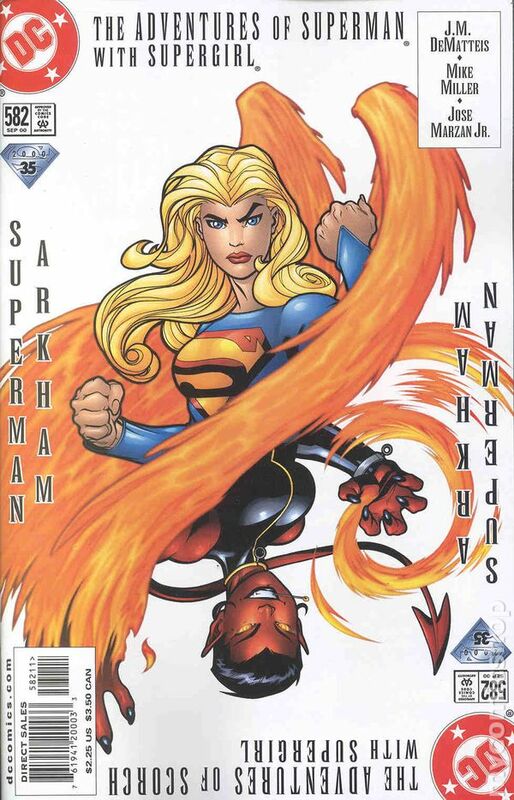 WRITTEN BY STUART IMMONEN AND MARK MILLAR; ART BY IMMONEN, YANICK PAQUETTE, JOSÉ MARZAN, JR., AND RICH FABER; COVER BY IMMONEN AND MARZAN, JR. In stores February 9. 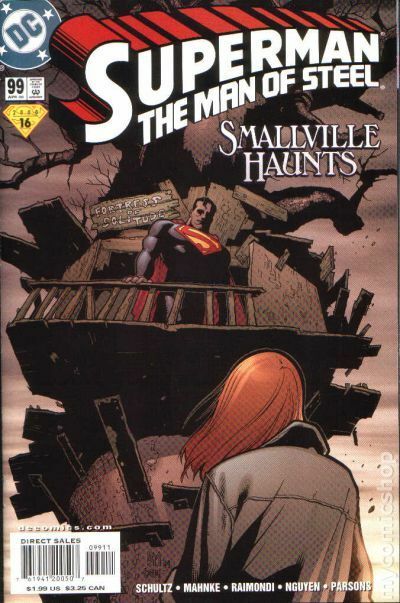 Smallville stories continue as Superman deals with the xenophobia of his own home town, where even the Man of Steel isn't trusted. Meanwhile, Luthor ? accompanied by Mercy ? surveys his new Metropolis; and Lois and Clark seem to suffer some marital problems. FC, 32 PG." Cover price $1.99. WRITTEN BY MARK SCHULTZ. 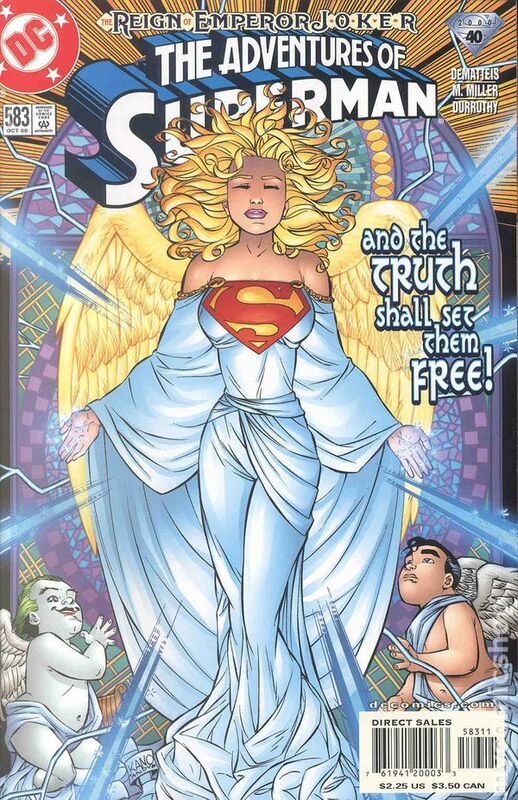 ART BY DOUG MAHNKE, PABLO RAIMONDI, TOM NGUYEN, AND SEAN PARSONS. 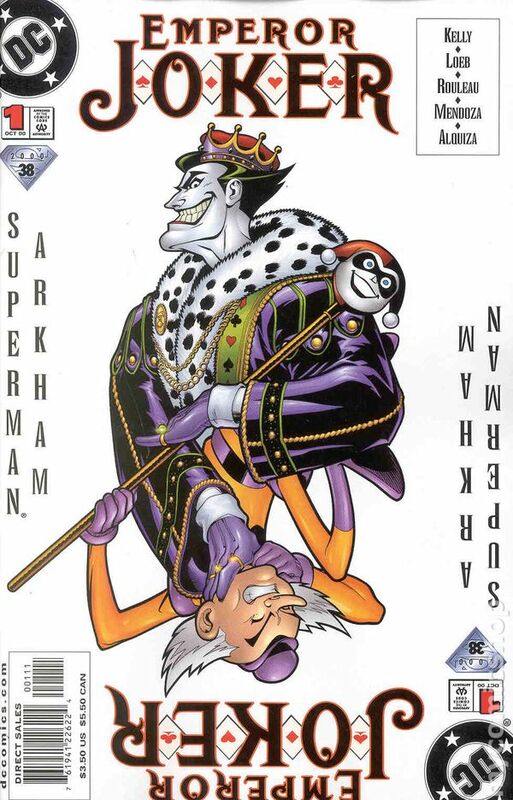 COVER BY MAHNKE AND NGUYEN. In stores February 16. 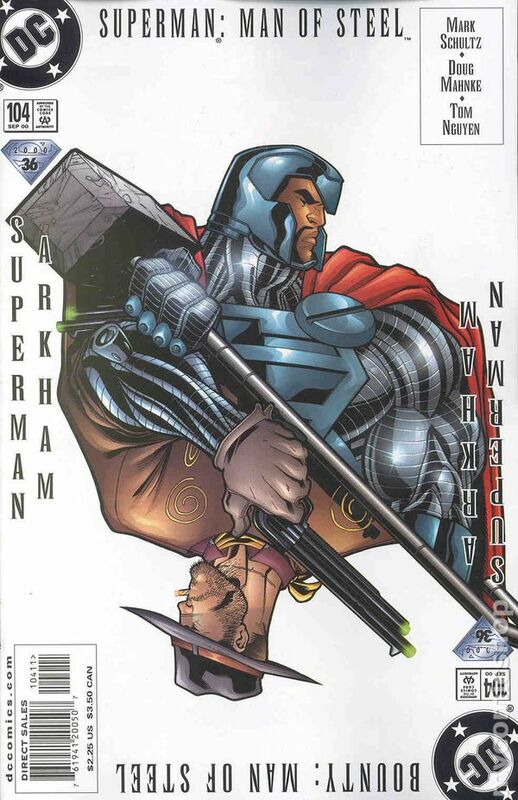 Steel debuts his new armor as he and Superman run into the Cyber-moths, pirates out to steal Metropolis's new tech for their mysterious boss. Meanwhile, back in Smallville, Superman is reunited with Lana Lang and Pete Ross. Can Superman save Pete from a witch who believes him to be the source of a terrible evil? FC, 32 PG." Cover price $1.99. 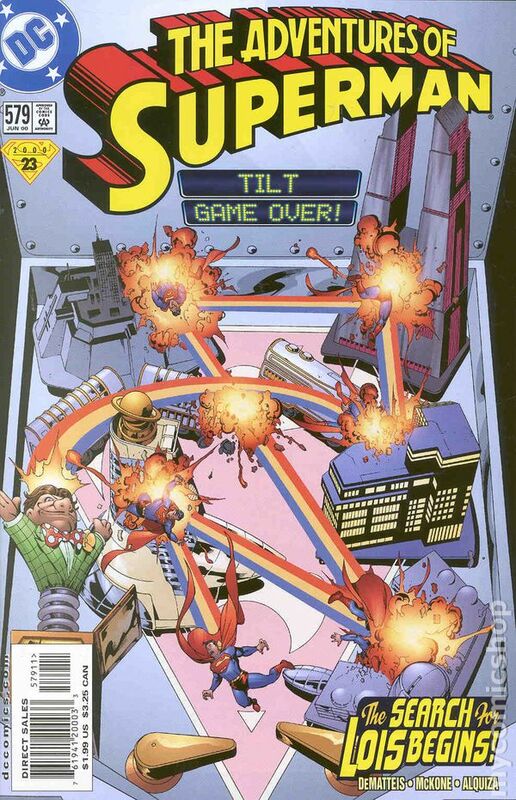 WRITTEN BY JOE KELLY; ART BY KANO AND JOE RUBINSTEIN; COVER BY GERMAN GARCIA AND JOHN DELL. 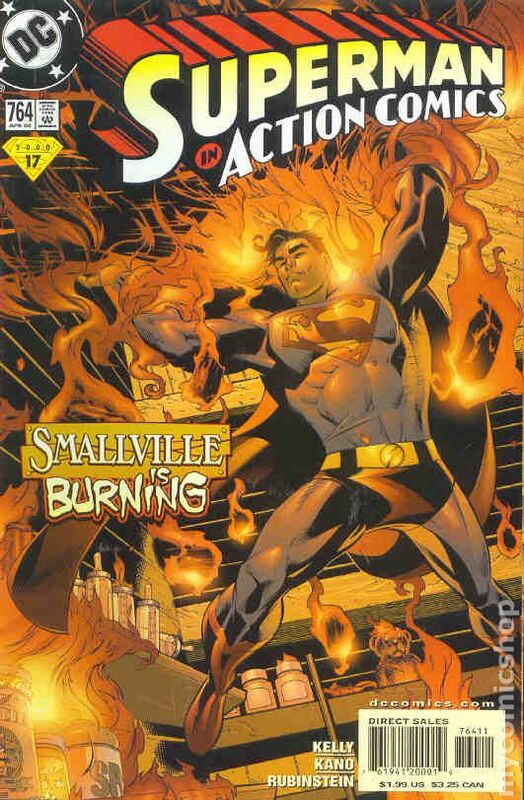 The finale of the Smallville visit finds the Man of Steel seemingly unable to save a woman's babies from a fire. Is this tragedy as real as it seems? Plus, Lana tries to comfort Clark as he and Lois's troubles get worse. Full Color, 32 pages. Cover price $1.99. 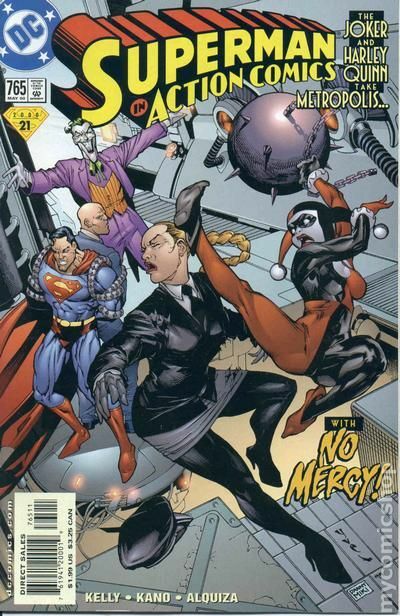 Published May 2000 by DC. 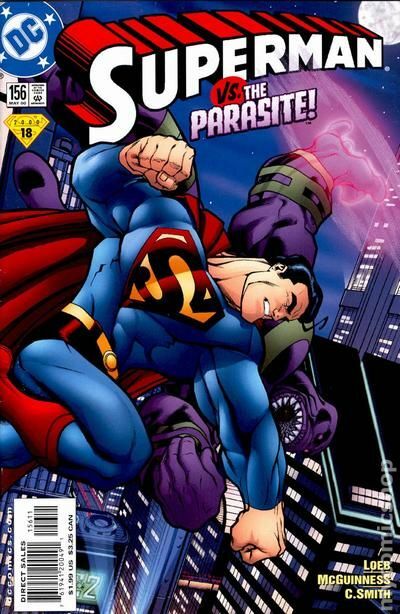 WRITTEN BY JEPH LOEB; ART BY ED MCGUINNESS AND CAM SMITH; COVER BY MCGUINNESS AND JASON MARTIN The new, improved Parasite strikes and when he does the Man of Steel feels it like never before! Plus, both Lana Lang and Wonder Woman visit Metropolis, which doesn't help the strained marital relations between Lois and Clark. FC, 32 PG. Cover price $1.99. WRITTEN BY J.M. DEMATTEIS; ART BY PABLO RAIMONDI AND JOSÉ MARZAN JR.; COVER BY TERRY DODSON AND MARK FARMER In stores March 8. New series writer J.M. 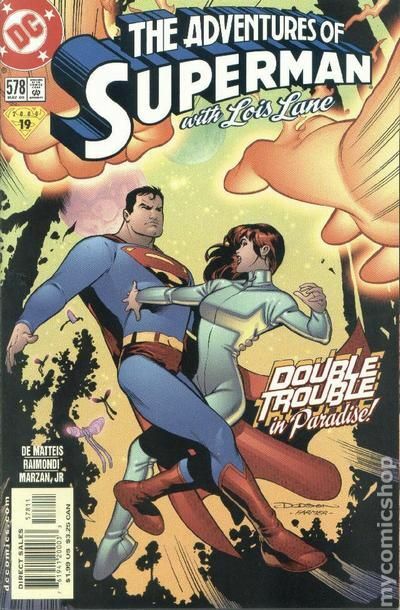 DeMatteis makes his debut as Superman and Lois travel to an alien utopia in hopes of helping their troubled relationship. But there's a terror in paradise, and death to the couple is its counselling! Plus, Superman shows signs of being...sick? FC, 32 PG. Cover price $1.99. WRITTEN BY MARK SCHULTZ. ART AND COVER BY DOUG MAHNKE AND TOM NGUYEN. 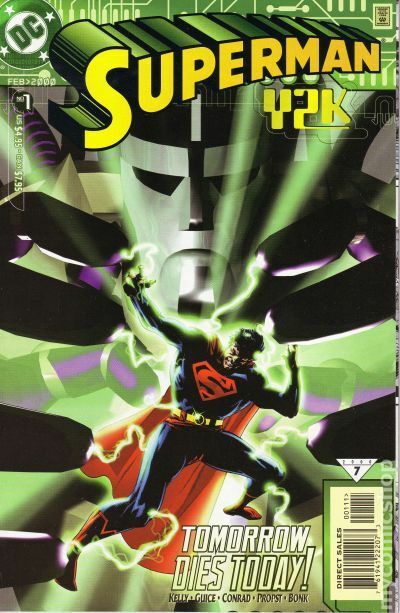 An extra-length issue guest-starring Steel and introducing a new Fortress of Solitude! A cardstock cover with a Fortress-revealing gateleg highlights this exciting issue, which also features the return of the evil Cyborg Superman. FC, 48 PG. Cover price $3.99. WRITTEN BY MARK SCHULTZ. ART AND COVER BY DOUG MAHNKE AND TOM NGUYEN. 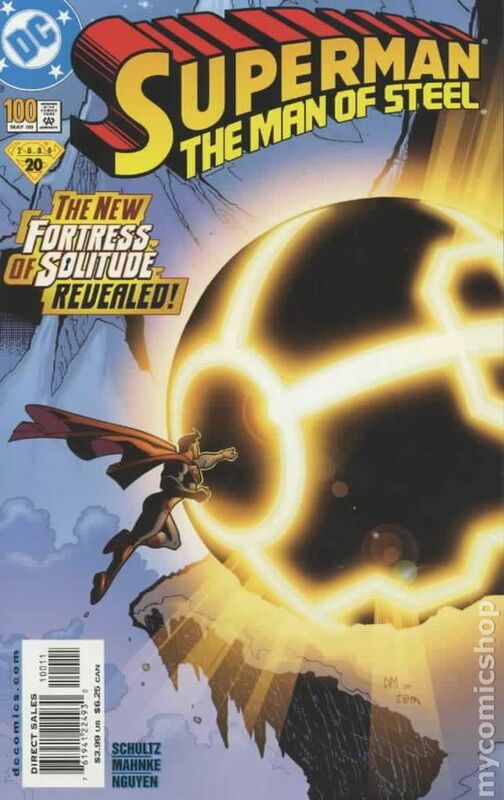 An extra-length issue guest-starring Steel and introducing a new Fortress of Solitude! Cover price $3.99. WRITTEN BY JOE KELLY; ART BY KANO AND JOE RUBINSTEIN; COVER BY YVEL GUICHET AND DANNY MIKI. Joker and Harley Quinn come to Metropolis! Wild and wacky mayhem ensues as it's payback time, Joker style! He's gonna chop LexCorp Tower down, and the mysteriously ailing Man of Steel is not in any shape to stop him. And you won't wanna miss the fight between Harley and Mercy! Full color, 32 pages. Cover price $1.99. Published Jun 2000 by DC. WRITTEN BY JEPH LOEB; ART AND COVER BY ED MCGUINNESS AND CAM SMITH; COVER BY MCGUINNESS AND JASON MARTIN In stores April 5. Lois vs. Superman? The worst thing that could ever happen to the couple has seemingly come to pass, and not all of the Man of Steel's powers can do anything to stop it! Plus, the threat of the Parasite lingers for one final bout! FC, 32 PG. Cover price $1.99. WRITTEN BY J.M. DEMATTEIS; ART AND COVER BY MIKE MCKONE AND MARLO ALQUIZA In stores April 12. Lois has vanished! But before Superman can even begin to search for her, the new, improved Prankster strikes! This is no laughing matter, especially with Superman's health beginning to fail! Plus, another new foe ? the Adversary ? arrives on the scene, hoping to make a name for himself by defeating the Man of Steel. FC, 32 PG. Cover price $1.99. WRITTEN BY MARK SCHULTZ. ART AND COVER BY DOUG MAHNKE AND TOM NGUYEN. Superman is growing sicker. In fact, he's starting to glow green. Can even Steel keep our hero going long enough to mount a strike against the man Superman is certain holds Lois captive: Luthor? FC, 32 PG. Cover price $1.99. WRITTEN BY JOE KELLY; ART BY CARY NORD AND MARK LIPKA; COVER BY IAN CHURCHILL AND NORM RAPMUND. Can even guest-star Batman help Superman find the missing Lois? 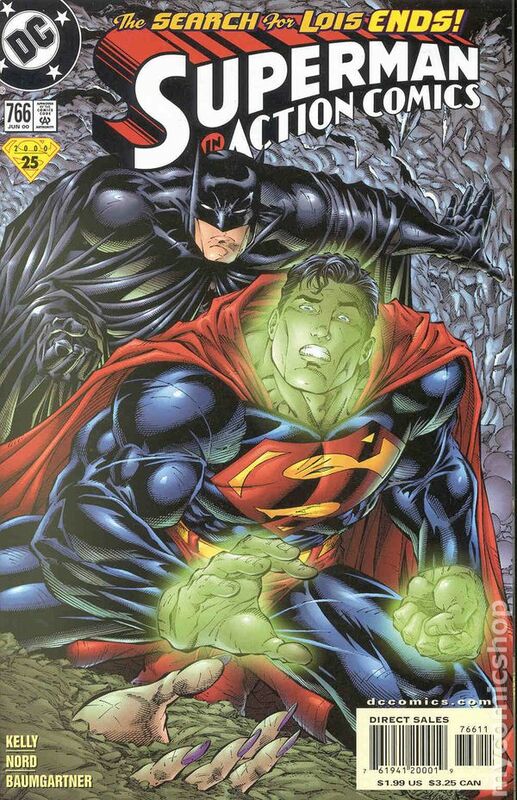 A dying Superman asks for help from the Dark Knight Detective to find his lost love. But even if the World's Finest team can settle their differences and find her, will it be too late for Lois and Clark? Full color, 32 pages. Cover price $1.99. 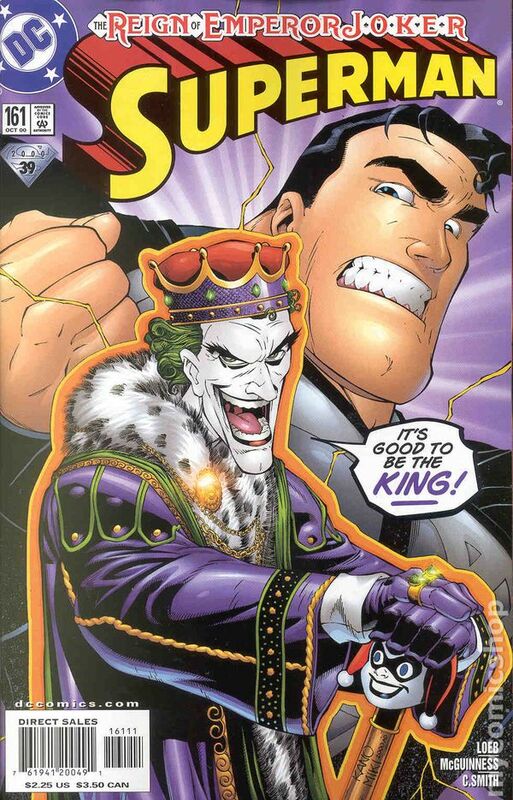 Published Jul 2000 by DC. 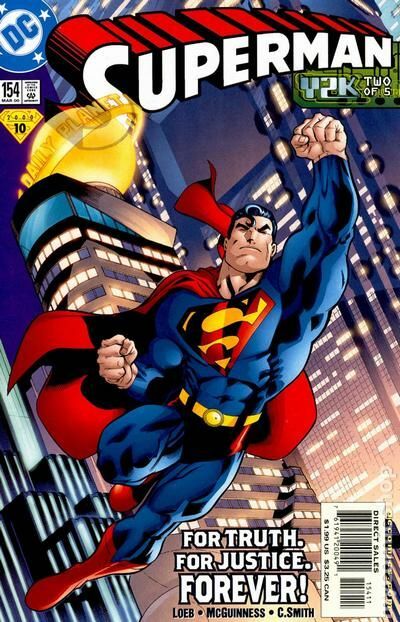 WRITTEN BY JEPH LOEB; ART BY DUNCAN ROULEAU AND JAIME MENDOZA; COVER BY DOUG MAHNKE AND CAM SMITH Team Superman and the Atom must make a fantastic voy ... journey to save the Man of Steel in Part 1 of the 4-part Critical Condition! 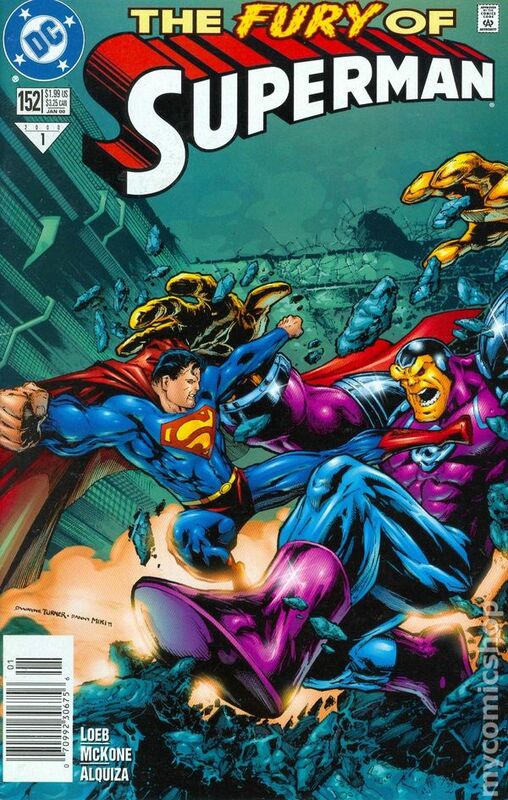 Superman has collapsed and now it's up to the Atom and Team Superman (Superboy, Supergirl, and Steel) to save him. And the only way to do that is to shrink and enter Superman's body! FC 32 pgs. Cover price $1.99. WRITTEN BY J.M. 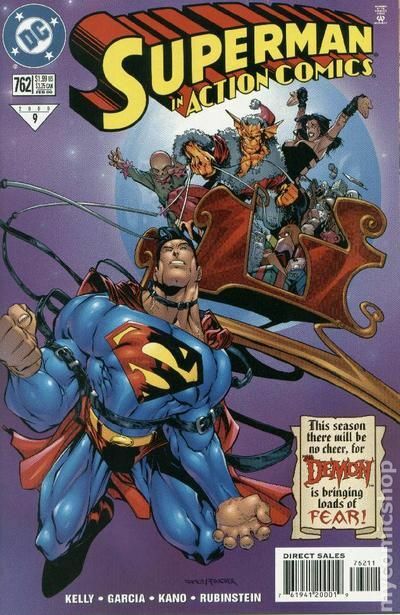 DEMATTEIS; ART BY CARLO BARBERI AND JOSE MARZAN JR.; COVER BY DOUG MAHNKE AND DANNY MIKI. In stores May 10. Critical Condition, part 2 of 4. 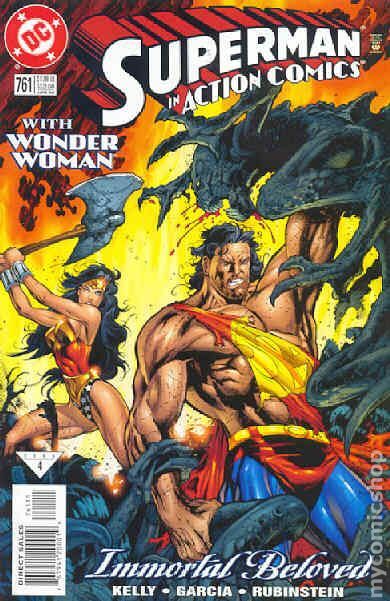 Team Superman tries to survive inside Superman's body while Encantadora rushes to find Lois and give her information that could save the Man of Steel! But will Encantadora reach Lois before Deathstroke the Terminator catches up to her? FC 32 pgs. Cover price $1.99. WRITTEN BY MARK SCHULTZ. ART AND COVER BY DOUG MAHNKE AND SCHULTZ. Critical Condition, Part 3 of 4. There's a traitor among Team Superman, and he's trying to get them all killed. 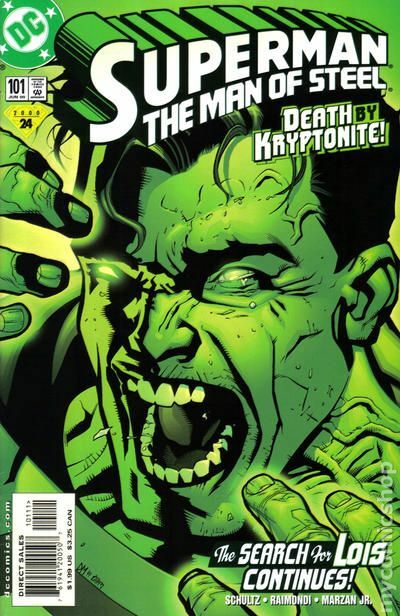 Plus, the "Kryptonite killer" is revealed! FC 32 pgs. Cover price $1.99. WRITTEN BY JOE KELLY; ART BY KANO AND MARLO ALQUIZA; COVER BY DOUG MAHNKE Critical Condition (4/4) concludes! 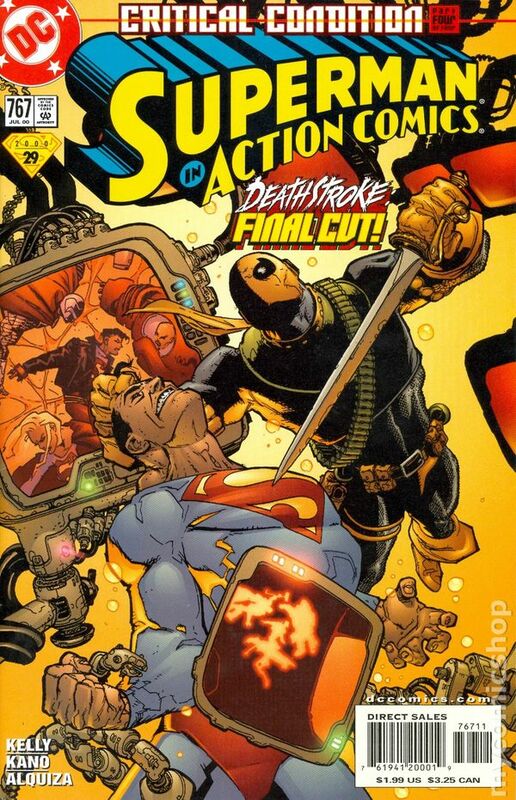 Superman battles Deathstroke while, inside his body, the tiny Team Superman feels every blow. And things grow steadily worse for the microscopic heroes because they're starting to return to normal size! FC 32 pgs. Cover price $1.99. WRITTEN BY J.M. DEMATTEIS; ART BY MIKE MILLER AND WALDEN WONG; COVER BY SEAN CHEN AND BRETT BREEDING In stores June 14. 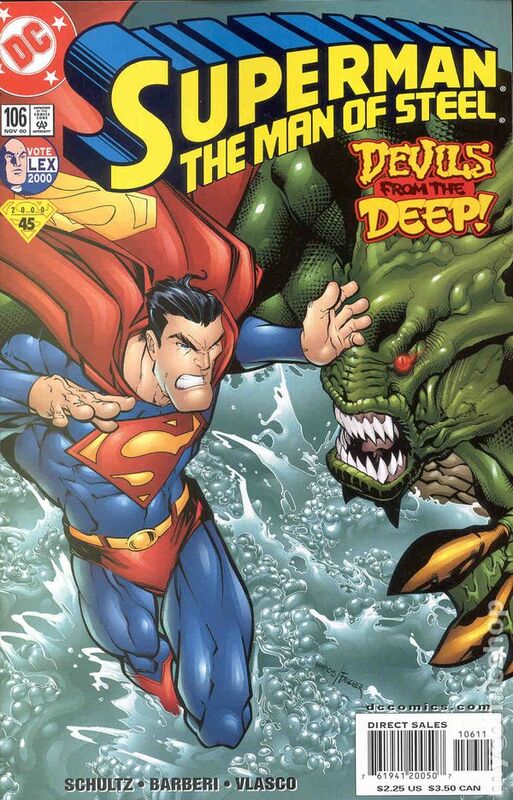 Adversary returns to plague the Man of Steel, while Lex Luthor makes a startling announcement. 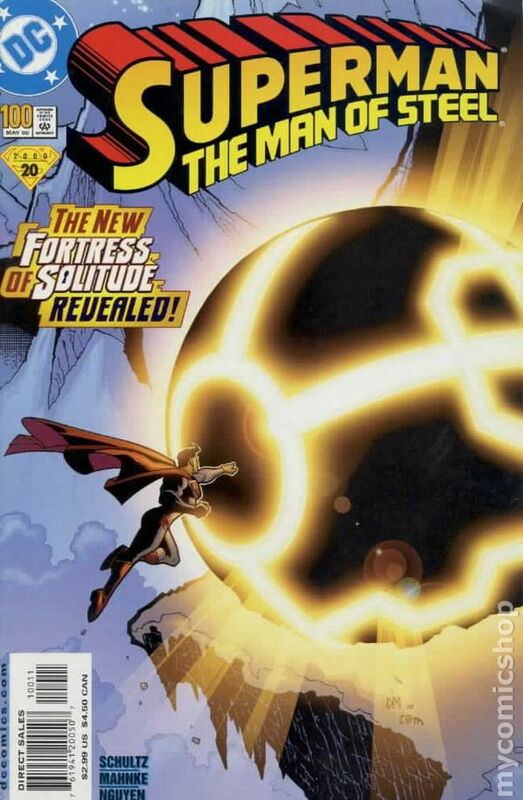 Plus, the mysterious Thorn appears in the revamped Metropolis, and Prankster has his eye on her. FC, 32 PG. Cover price $2.25. WRITTEN BY MARK SCHULTZ. ART BY DOUG MAHNKE AND TOM NGUYEN. COVER BY TOM RANEY AND TIM TOWNSEND. Supergirl and Aquaman guest in a tumultuous issue! What crisis is too big for both Superman and Supergirl to handle? Learn the answer as a great storm threatens Metropolis, one that may be far more ominous than it seems. FC, 32 PG. Cover price $2.25. 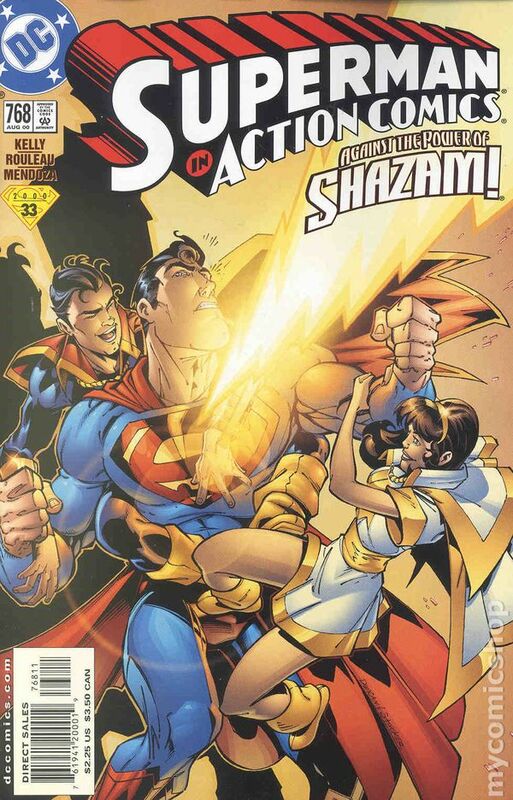 WRITTEN BY JOE KELLY; ART BY DUNCAN ROULEAU AND MARLO ALQUIZA; COVER BY ROULEAU AND TERRY AUSTIN The Marvel Family guest-stars as Mary and Freddy (two of the Captains Marvel, 'natch) ask Superman's help in rescuing the Original Captain Marvel, but Superman will pay dearly in the attempt. Meanwhile, Lois tries to track down the villain that nearly killed her husband with Kryptonite. FC, 32 PG. Cover price $2.25. 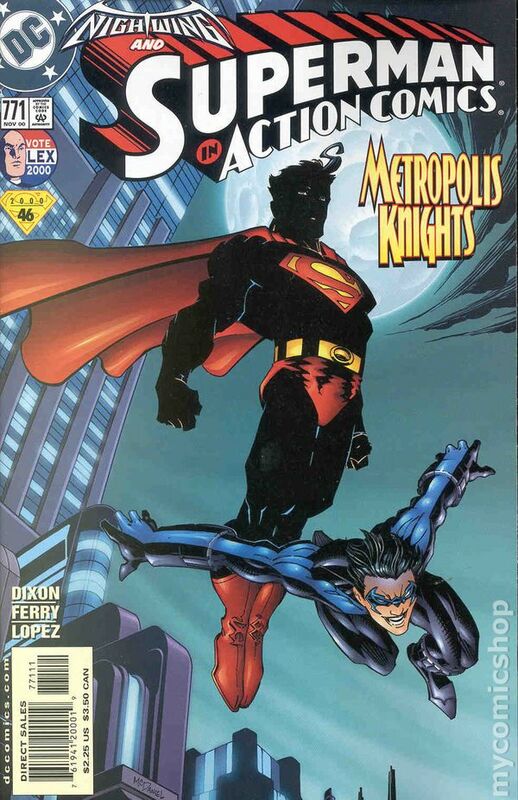 Published Sep 2000 by DC. WRITTEN BY JEPH LOEB; ART AND COVER BY ED MCGUINNESS AND CAM SMITH The Super-event of the Summer begins with Part 1 of the 4-part "Superman: Arkham!" Able to bend steel in his bare hands, leap tall buildings in a single bound, it's the black-clad, most wanted criminal to escape Arkham Asylum: Superman. 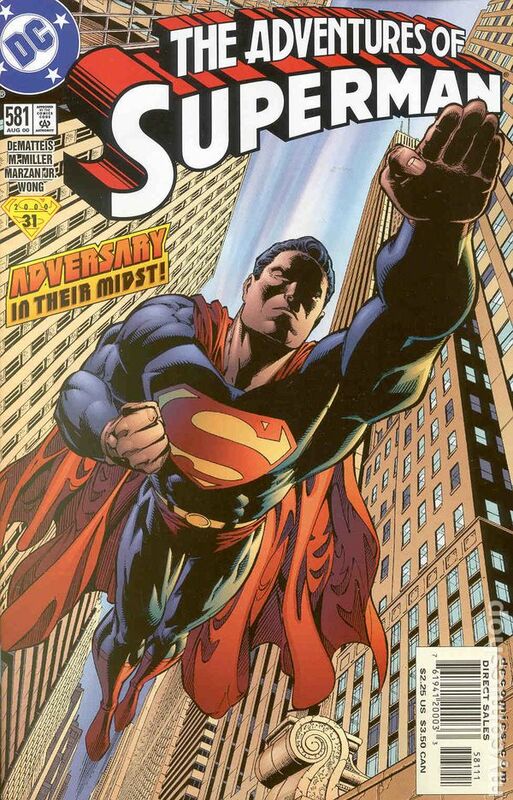 Night after night he escapes his prison, only to be brought back as the sun comes up by Earth's Greatest Hero: Bizarro! And each night, like clockwork, a painful scream can be heard in the distance... FC, 32 PG. 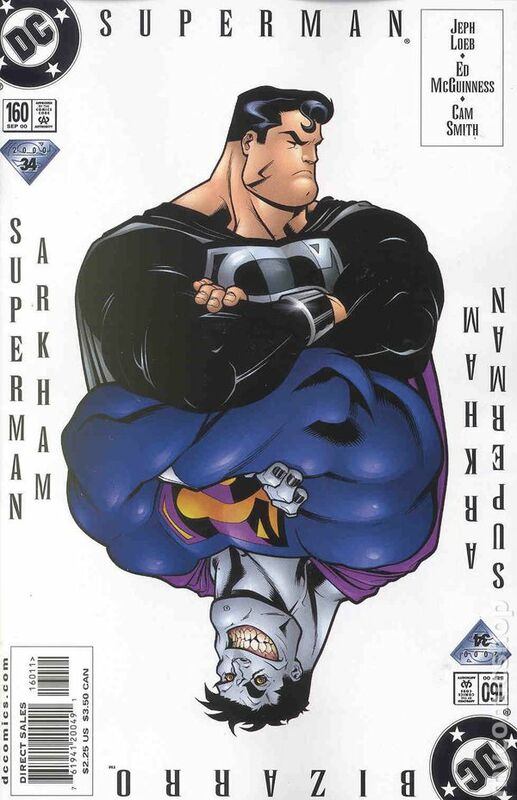 Superman Arkham #1 Cover price $2.25. WRITTEN BY J.M. DEMATTEIS; ART BY MIKE MILLER AND JOSÉ MARZAN, JR.; COVER BY ED MCGUINNESS AND CAM SMITH In stores July 12. Part 2 of "Superman: Arkham!" Lois Lane, the richest, most powerful woman in the world shouldn't care about the Kryptonian super-villain named Superman, yet there's something about him... Nevertheless, it won't stop her from conducting sadistic experiments on him. Meanwhile, can anything equal the terror of the humongous Turtle Boy? And the screaming continues... FC, 32 PG. Cover price $2.25. WRITTEN BY MARK SCHULTZ. ART BY DOUG MAHNKE AND TOM NGUYEN. COVER BY ED MCGUINNESS AND CAM SMITH. There's no escaping the madness in Part 3 of "Superman: Arkham!" The Science Police are after John Henry Irons for committing the heresy of thinking logically. Can the rusted-out Steel convince Superman that 2 + 2 doesn't equal "fish" before the deadliest hired gun ever, Bounty, gets the duo in his high-tech crosshairs? And who's the guy trying to send Superman a message that may resolve this whole riddle of a world? And the screaming gets louder... FC, 32 PG. Cover price $2.25. WRITTEN BY JOE KELLY; ART BY KANO AND MARLO ALQUIZA; COVER BY ED MCGUINNESS AND CAM SMITH The secrets are revealed in the conclusion to "Superman: Arkham," setting the stage for next month's even more incredible "Superman: Emperor ????????"! A day has passed and Superman did not return to Arkham! Are things turning back to the way we remember them? Nope. Things just get worse, so just get an order of fries from the Superburgerboy and watch the confusion mount. 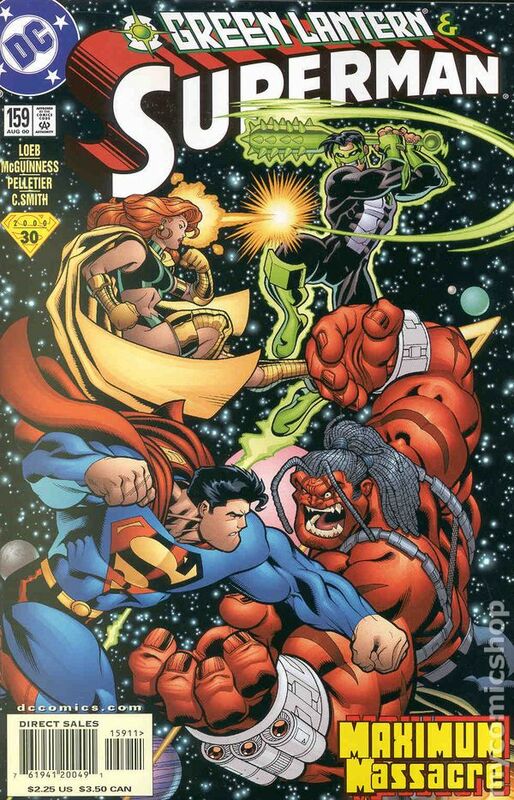 Superman and Steel make it onto the the JLA Watchtower and encounter two of this League's deadliest members: the strangely seductive Gorgeous Gilly (the ugliest woman you've ever seen) and Ignition, whose explosive temper has a nuclear core. It all leads to revealing who is behind all this madness and maybe, just maybe, who's been doing all the screaming. FC, 32 PG. Cover price $2.25. Published Oct 2000 by DC. WRITTEN BY JEPH LOEB AND JOE KELLY; ART BY DUNCAN ROULEAU, JAIME MENDOZA AND MARLO ALQUIZA; COVER BY ED MCGUINNESS AND CAM SMITH In stores August 2. In the aftermath of "Superman: Arkham," the Man of Steel must try to restore the JLAers' memories in an extra-sized one-shot! 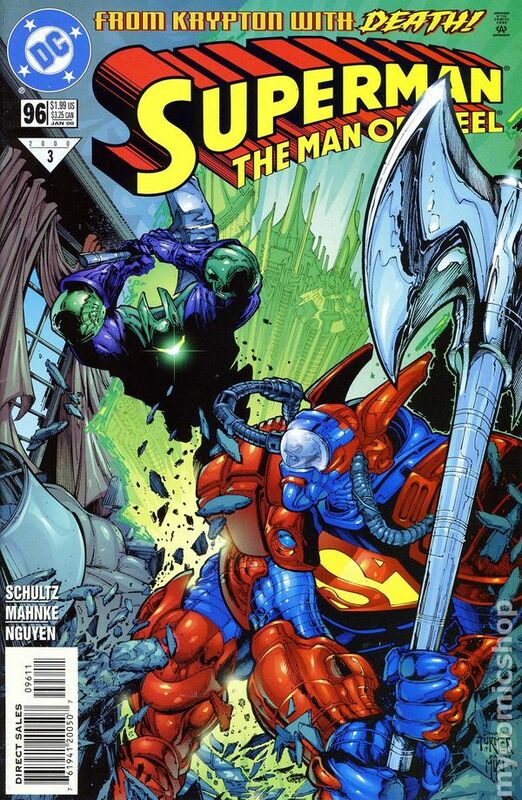 Superman and Steel stand alone against a horribly twisted world, but will knowing who is responsible for mangling reality give them the edge they need to assemble Green Paper Lantern, the Fish-headed Aquaman, a criminally prim Wonder Woman, and, of course, the Flab? FC, 48 PG. Cover price $3.50. WRITTEN BY JEPH LOEB; ART BY ED MCGUINNESS AND CAM SMITH; COVER BY KANO AND DANNY MIKI In stores August 9. "Superman: Emperor ????????" 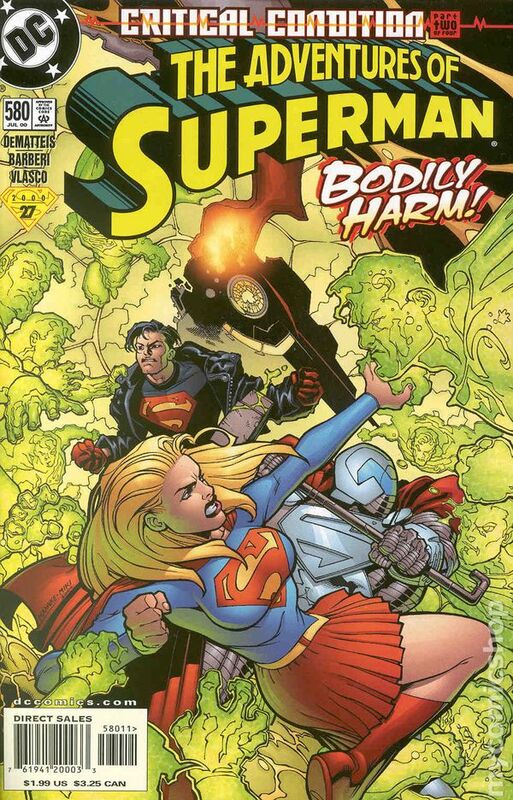 continues with the deaths of Superboy and Supergirl! A shocking betrayal derails the assembled heroes' assault on the Emperor's fortress, setting the stage for the villain named Ignition's killing Superboy and Supergirl! FC, 32 PG. Cover price $2.25. WRITTEN BY J.M. DEMATTEIS; ART BY MIKE MILLER AND JOSÉ MARZAN, JR.; COVER BY KANO AND ANDY LANNING In stores August 16. Part 3 of "Superman: Emperor ????????"! Lois and Steel are in the Emperor's clutches and Superman is trying to bring another old friend back to life before he dies again himself. But things get even worse when this twisted world comes to a grisly end! For more information, see the feature article.FC, 32 PG. Cover price $2.25. 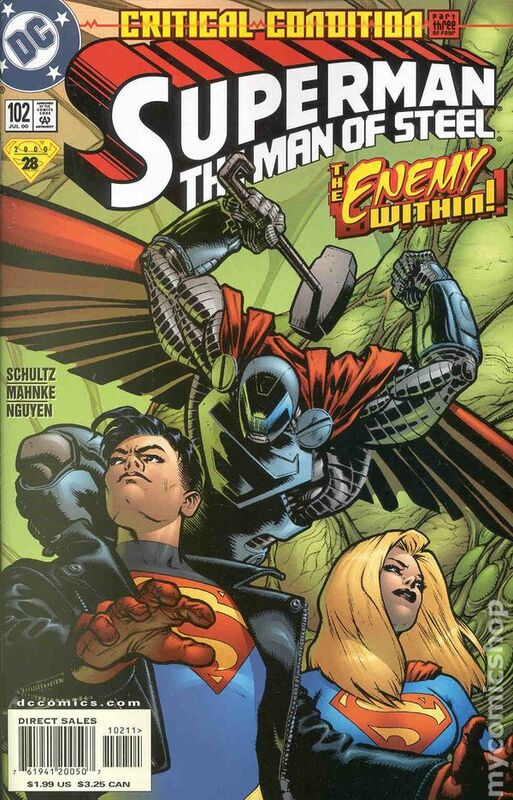 WRITTEN BY MARK SCHULTZ; ART BY DOUG MAHNKE AND TOM NGUYEN; COVER BY KANO AND DREW GERACI "Superman: Emperor ????????" nears its reality-twisting conclusion! Will Superman die again? It seems unlikely, but he might prefer it to the alternative he suffers this issue as he and the rest of Team Superman are transformed into...Super-Pets? Have we lost our minds? FC, 32 PG. Cover price $2.25. 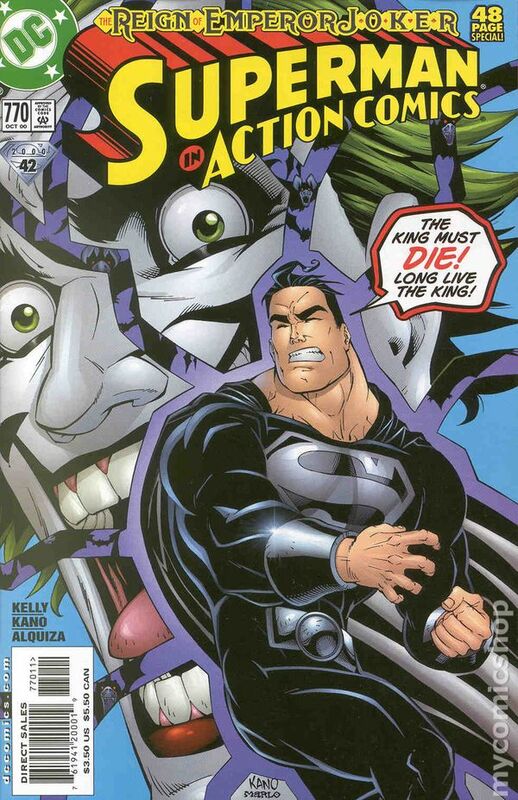 WRITTEN BY JOE KELLY; ART AND COVER BY KANO AND MARLO ALQUIZA An extra-sized issue concludes "Superman: Emperor ????????"! The battle is over and the obscenely powerful Emperor holds the upper hand. As evil wins and good faces ultimate defeat, is this the ultimate Bizarro ending? FC, 48 PG. Cover price $2.25. WRITTEN BY J.M. 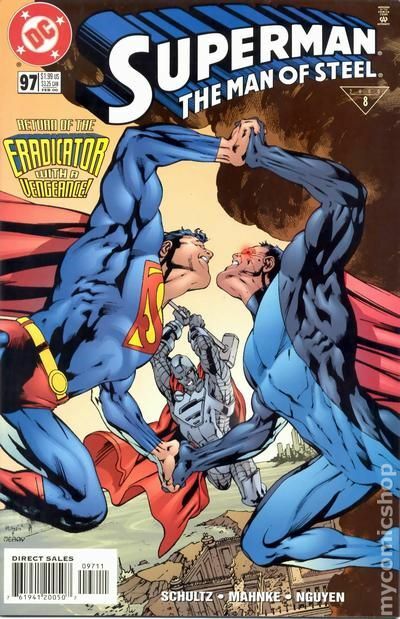 DEMATTEIS; ART BY PATRICK ZIRCHER AND JOSÉ MARZAN, JR.; COVER BY MIKE MILLER Superman must choose between saving Metropolis and...a bachelor party? Wedding bells are imminent for Ron Troupe ? Clark's brother-in-law-to-be ? but the Man of Steel has to juggle fun and saving Metropolis from Devouris the Conqueror. But the real threat lies in the deal Lex has just made with the devil. It all ends in wedding bells, but for whom do they toll? FC, 32 PG. Cover price $2.25. WRITTEN BY MARK SCHULTZ; ART BY CARLO BARBERI AND JUAN VLASCO; COVER BY HUMBERTO RAMOS AND WAYNE FAUCHER In stores September 20. Lori Lemaris came to warn Superman about a threat, but the big red "S" is missing. 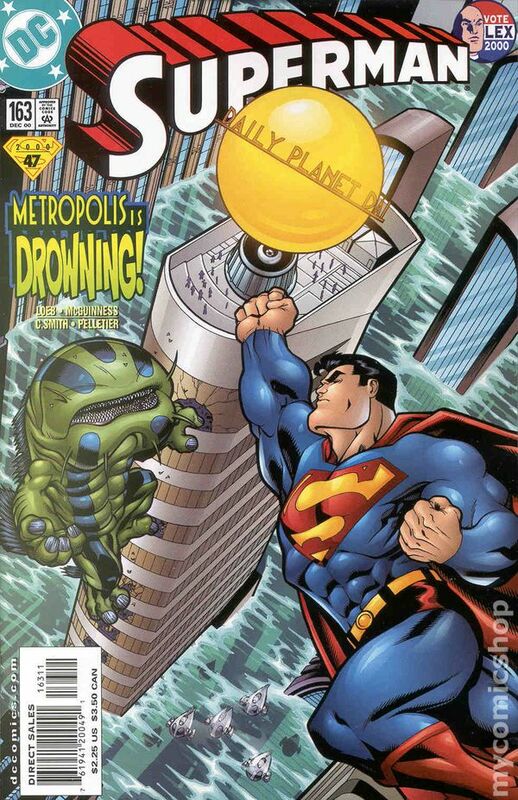 So now it's up to Lois and Steel to combat the underwater terror of Kosnor and Netkon ? two devil fish that are looking to drown the city! FC, 32 PG. Cover price $2.25. 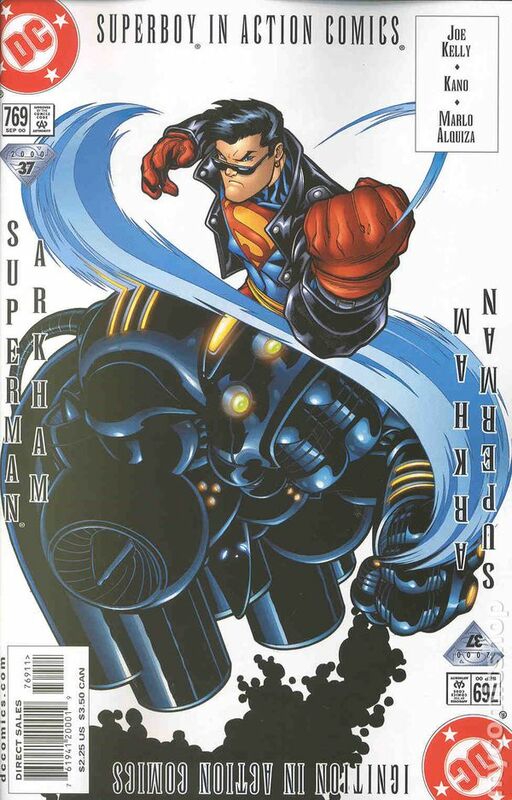 WRITTEN BY CHUCK DIXON; ART BY PASCUAL FERRY AND ALVARO LOPEZ; COVER BY SCOTT MCDANIEL Nightwing guest-stars in an issue written by NIGHTWING's Chuck Dixon! Intergang's been trying to spread its corruption into Blüdhaven, but Nightwing is trying to stem the tide at its source: Metropolis. 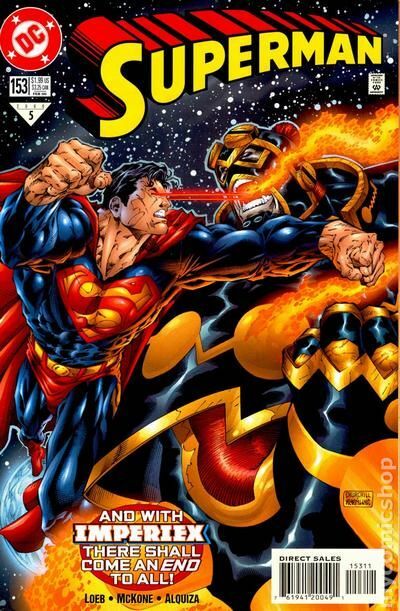 But soon both he and the Man of Steel are fighting for their lives against the metal might of Cyber-assassins. It's good clean collateral damage for the whole family. FC, 32 PG. Cover price $2.25. WRITTEN BY J.M. DEMATTEIS; ART BY MIKE MILLER AND JOSÉ MARZAN, JR.; COVER BY MILLER In stores October 11. Superman has his hands full with keeping Metropolis intact! Lex Luthor attempts to use the city's technology to terraform the rest of the country in his bid for the presidency. 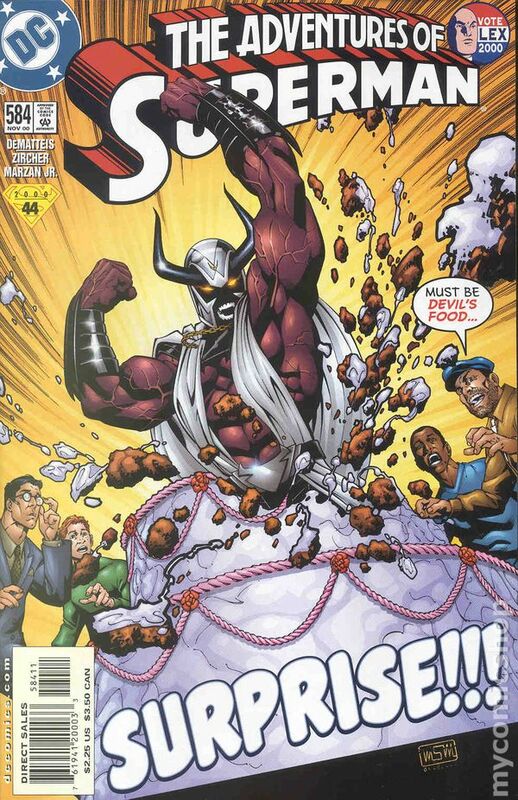 Satanus tries to control the city's soul by using Superman's friends and foes to get it. And a mysterious Native American woman just wants to take Metropolis back for her people. Will the Man of Steel be able to keep his city safe? FC, 32 PG. Cover price $2.25. 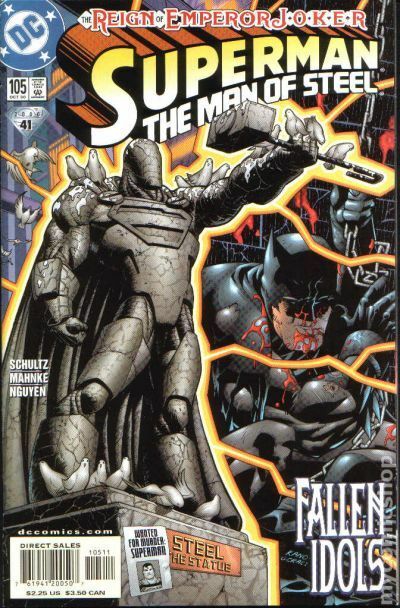 WRITTEN BY MARK SCHULTZ; ART BY DOUG MAHNKE AND TOM NGUYEN; COVER BY MAHNKE A perilous journey back into the Phantom Zone awaits Superman and Steel, as they jump into unimaginable danger in order to retrieve Luna, leader of the Cyber-Moths. But it seems the villainess has made some friends during her stay, and they're about to give the Super-team a whole lot of trouble! FC, 32 PG. Cover price $2.25.